Your reception or waiting area will probably be the space with the most impact in your entire office. It’s the first point of contact when clients decide to acquaint themselves with the “home” environment of the service or product they’re interested in, and it’s often the space that leaves the strongest impression. More than creating an inviting space for clients and visitors, your reception area reflects your business style and conveys your brand personality. Even more importantly, it tells prospective clients what you can do for them and how you are going to treat them from now on. Is your reception furniture streamlining business operations and client interactions or sabotaging your reputation? 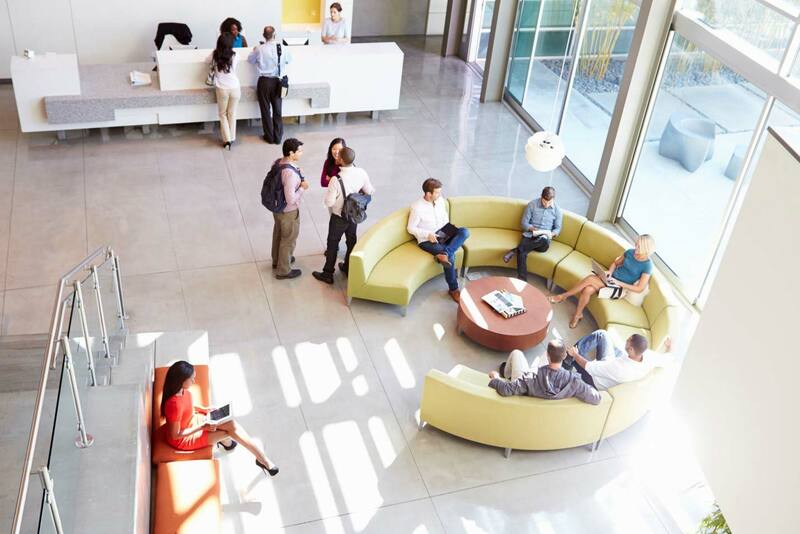 Here are some points to consider when refurbishing the reception/waiting area in your office. Configuration Is Key. Reception employees have two crucial and equally important roles to fulfill: to be friendly and efficient. They must be able to engage with clients while sitting or standing at their desk without losing privacy, so it’s essential to consider reception furniture designs that don’t hinder any of these two functions. A well-configured reception desk can hide numerous sins, from stacks of paper and coffee mugs to personal belongings, but it also addresses key issues such as wire management and file storage. The reception desk you acquire must be high enough to ensure the needed privacy for your staff, but not too high to encumber face-to-face interaction with clients. Create a Modern Look. The days of walking into an office to be greeted by a heavy, clunky wood desk are finally over. Now, the warmth and hospitality of a company are recreated by soft lines and sleek curves meant to convey a positive feeling of being welcomed into a friendly environment. The most popular options involve a combination of timber/laminate with steel and glass panels to add interest and break up a solid surface. Light, sleek, and airy, modern reception furnishings will give the impression that your company is forward-thinking and innovative, which is something that seals the deal for most customers. Ergonomics above All. When it comes to reception furniture, you need style, and you definitely need functionality, but you will get nowhere without ensuring proper comfort. In an office setting, comfort means ergonomics, and it involves fitting the workstation to the employee so that they both function optimally and to the benefit of your company. Reception desks should be of the right height to allow client-employee interaction and be fitted with accessories that encourage correct posture and joint health. Anatomically-correct task chairs, monitor arms, CPU holders, footrests, and keyboard trays will reduce employees’ strain and stress factors, allowing them to be more rested, energetic, and friendly with your clients. Function Matters. Acquiring the right reception furniture means furnishing this area in accord with its purpose. Is your reception area a space where clients simply check in and then move forward or are they seated and asked to wait for a while? The receptionist’s function will only be to welcome new clients inside the office or will there be other tasks he/she will need to perform? Depending on the type and amount of work carried out at the desk, you should choose furniture that streamlines all operations but doesn’t exceed in size/function. With so many roles and functions of reception furnishings, it’s worth spending some real time thinking at how the waiting area in your office can make both your staff and visitors comfortable. Talk to a professional office furniture supplier who can ensure your reception furniture ticks every box and meets all your business needs – it will definitely be one of your most profitable investments.